For Rochester, music is a healer, a communicator, a way of life. The Toronto-born artist got his start in 2002 when his song "Young Luv" won a nation-wide contest through then-emerging FLOW 93.5. 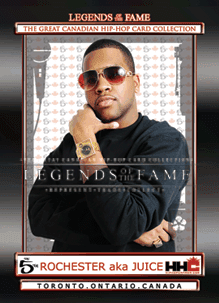 In 2008, Rochester's track "Pull Up", produced by Boi-1da, won a Stylus Award for Best Canadian Hip-Hop single, following nominations for two MMVAs and a Canadian Music Award. As the founder of Eagle Eye Records, Rochester is known for blending elements from all types of music, resulting in his signature Genreless style.